Former NYPD cop turned private detective Moe Prager has always been philosophical, but with a recent diagnosis of stomach cancer, he finds himself looking back upon his life with concentrated force. He needs to come to grips with the verdict before he can share the news. His daughter’s wedding is in a few weeks. Once that’s over he can tell people. So it makes perfect ironic sense that his ex-wife Carmella comes back into his life. There’s been no communication between them since she left him eight years ago taking her son, one Moe had been raising on his own, to Toronto. What does she want from his life? She’s looking for help in finding out who killed her sister. Carmella’s sister Alta, an FDNY EMT, first ends up on the news when she and her partner refuse to treat a cook who faints while they are at a fancy bistro. All of the New York media crucifies them, but they never get to tell their side of the story. The second time she makes the nightly news roundup is when she gets stabbed in Brooklyn. In the past, Carmella cut her sister and the rest of her family out of her life after she was raped as a child—and blamed them for it. But now she seems to want to do the right thing: find out what happened to her sister because the cops sure don’t want to investigate. So Moe figures that maybe taking on this case will keep his mind off his illness. Maya, Alta’s EMT partner, gives Moe boxes of hate mail that came to her after “the incident.” She doesn’t want to talk about what happened either, but hints there’s more to the story. Moe finds one intriguing piece of mail, tracing it to an honest-to-god FDNY hero, Jorge Delgado. Turns out Jorge, a proud Puerto Rican, has spent a lot of time trying to further his people’s rise in the white, Catholic FDNY. He doesn’t like the fact that Alta brought shame on his efforts by refusing to treat the cook. On top of that she is a lesbian! Righteous Jorge gets killed when he runs into the street to save a girl, and now he’s a saint who martyred himself for his job. It seems everywhere Moe turns, people are so self-centered that they engage in only their own lives and think very little of the consequences of shading the truth. Even Carmella isn’t altruistic in her motivations. Those are just a few of the ironies Reed Coleman has set up in Hurt Machine, interesting twists on the usual tough, jaded PI character. Moe may be road hardened, his cynicism an outgrowth of long battles in the trenches, but he thinks about what he does before jumping in and reacting. 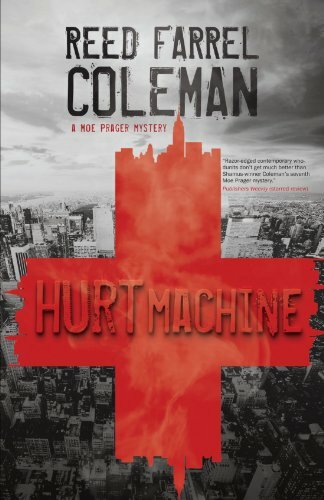 Mr. Coleman adheres to the lean storyline of classic noir by paring down the story to its most essential elements, making the narrative arc curve just right, and then adding in familial conflict to give it some unusual peaks. I sure hope Moe beats the cancer and comes back to solve some more crimes and misdemeanors.